Much attention has been paid recently to depressed energy prices, but it’s not all bad news in the oil and gas industry. This week, the Texas Railroad Commission (RRC) released its statewide April production numbers. Despite the gloomy energy price environment, the data show that Texas has managed to stay strong when it comes to crude oil production. According to the numbers, crude oil production in April of 2015 averaged 2,319,858 barrels per day. That’s more than a 13 percent increase from April of last year, when the state averaged just 2,043,461 barrels per day. 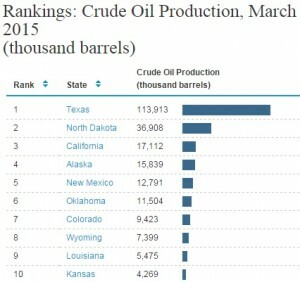 Karnes County – sitting atop the Eagle Ford Shale in South Texas – remained the top producing county in the state, reaching 6,503,269 barrels in April. Preliminary data from the month suggests that Texas’ oil production increased by over eight million barrels from April of 2014. Thanks to the state’s 164,316 oil wells, Texas remains the No. 1 oil producer in the nation, and the state now produces more natural gas than all of OPEC. 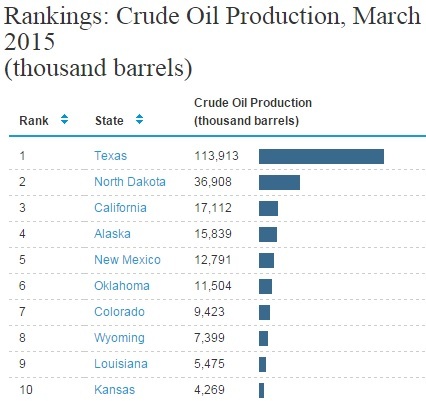 Data from the U.S. Energy Information Administration paint a clear picture of Texas’ dominance when it comes to American oil production. So far, June has been an incredibly strong month for the energy industry in Texas. Between the manufacturing boom brought on by shale production, the expansion of the state’s ports spurred by energy growth, and the latest production numbers from the RRC, there’s still much to be thankful for when it comes to oil and natural gas production in the Lone Star State.